It has almost been a year since the “525” update and about 6 months since the new rollers. In that time I/we have learned a lot about the DIY CNC world, CAM software, our electronics capabilities, as well as our steppers limitations. It is time for another improvement. The new XYZ parts are live on thingiverse now and allow your builds to either use 5/16″ or 8mm threaded rods as before, or now you can also use the T8 lead screws that have been made so readily available because of 3D printing. I thought I had valid reasons not to use T8 lead screws in the original design, 5/16 has a far higher mechanical advantage. The Z axis with a 5/16 or 8mm threaded rod means insanely low gearing and extremely high power…on paper, but that is only part of the equation. With the LowRider CNC design I found the 5/16″ rods have much higher friction, meaning less power transferred to the axis. With the Marlin RC8 firmware release I learned the just how far we were pushing the control boards processors and we found the hard limit of the atmega 2560 (Here) with 32nd stepping and such high steps per mm. This also made me do my home work, that I should have done in the beginning, and found the torque curves for typical NEMA 17 steppers drop dramatically above about 60 RPM’s. The lower torque at a higher RPM also means less power to use in the Z axis. Lesson learned. The lower RPM’s will increase the steppers usable torque. 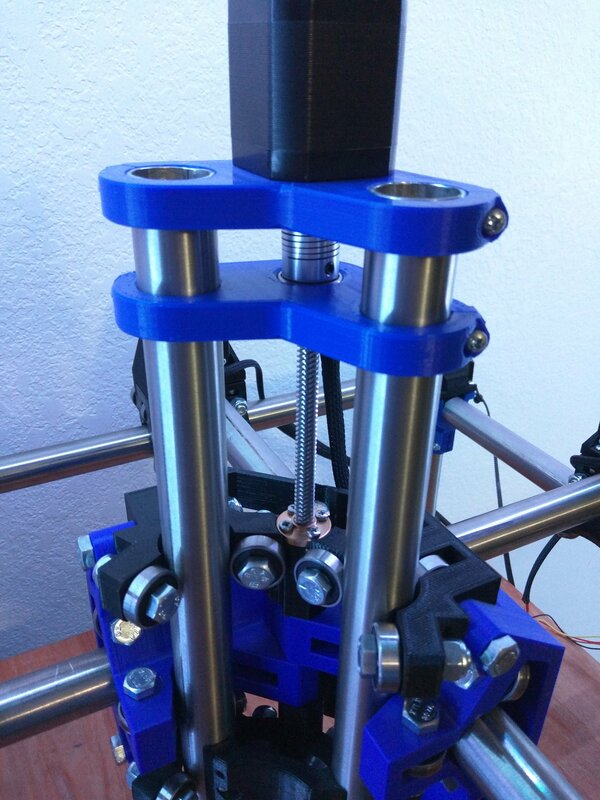 Using the new arrangement should result in higher z axis speeds and more z axis power as well. The new parts fit on the current 525 builds. You only need to take the nut out of your nut lock part and substitute in one new XYZ part on the top of the center gantry. From here you can use the 5mm to 8mm coupler, T8 Leadscrew and nut, and a few M3 screws (10mm up to 15mm). Flash or correct the firmware Z steps, with 32nd stepping 788 steps for the Z axis seems to give me the most accurate results. Possible downsides. The brass T8 nut might wear quickly, or more quickly that the regular coupling nuts we use, I have not had to replace one yet though. I have spares in the shop just in case. Attention needs to be paid when using the springy coupler to assure you have no backlash. This is done by mounting the leadscrew only about 8mm into the coupler and tighten it, make sure the motor shaft is touching the top of the leadscrew and slightly stretch the coupler before locking it in place, and finally by making sure the lower Z bracket bearing is in contact with the bottom of the coupler. This ensures the lead screw can not move up or down, and the only backlash that can happen would be at the nut. Some Old Guy Coding saves the day, and shows you how to do it. The printed parts kits and hardware bundles have been updated. Questions or comments should go here.